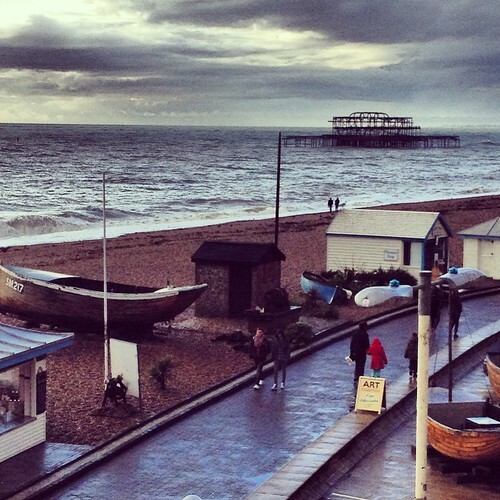 Instagram Brighton on a rainy day, a photo by PhotoPuddle on Flickr. There is a quote by fine art photographer Ansel Adams that I love. He said "There are no rules for good photographs, there are only good photographs". I love this because it's something that I too really believe. I think everyone has the potential to take wonderful photos. You don't need to be a professional who fiddles with their camera getting the settings right to take a great photo. You can just be an average person with any kind of camera - a old fashioned polaroid, an iPhone, a compact camera or a fancy DSLR - and when you see that perfect shot you just point and shoot. I think best photographs come from the heart if that makes any sense. I am always really pleased when I take a photo that turns out like this one. If I am taking a picture on my mobile phone that usually means I am in a hurry, only get to take one or two shots and have no time to think about photographic rules. When I saw this view I knew it would make a nice picture and after a bit of editing on my phone I ended up with this dramatic image. What about you? Do you always play by the rules?